Okay, so there’s like a million—no, more than a million—different kinds of diets and plans out there to lose weight (or to just eat your way to a healthier lifestyle). But one consistent theme in almost every weight loss plan is that increasing your protein intake. On a reduced-calorie plan, this promotes weight loss because foods that are high in protein take more work to digest, metabolize, and use. Basically, it means you burn more calories while processing them. And longer digestion time equates staying fuller, longer. In fact, according to the National Institutes of Health’s Dietary Reference Intake (DRI) guidelines, the average person (that isn’t trying to lose weight) should consume 0.36 grams of protein per pound of body weight. For example, a 150-pound female should consume 54 grams of protein a day. However, it’s advised for a person looking to lose weight (that also incorporates exercise into their plan) that they should consume anywhere from 0.5-0.8 grams of protein per pound of body weight (so 75-120 grams of protein a day for a 150-pound female). I know that if you’re someone who wants to lose weight, but your current diet consists of carbs and tequila, then those protein intakes can seem a bit intimidating. But don’t worry, just because you need to rev up your grams of protein, doesn’t mean you have to down a T-bone steak at every meal. Luckily, there are a ton of low-calorie, high-protein drinks that taste amazing and can add to your daily routine to help improve weight loss. So, I present to you, our list of the best tasting protein powders for weight loss. I’m not sure if it’s because I admittedly follow a lot of #fitspo accounts, but I am constantly coming across keto themed Instagrams. You’ve probably seen them too. These accounts post major weight loss transformation photos, yet also share pics of their meals which contain tons of bacon? And cheese? And heavy-cream coffees? Yup, those are the keto b*tches. The keto diet is basically a low-carb, high-healthy fat diet that basically forces the body to use ketones as a source of energy (instead of sugar). Well, Bulletproof is a keto-followers dream food and supplement brand as their product line includes things like: keto coffee, protein bars, and supplements that enhance the entire keto diet experience. 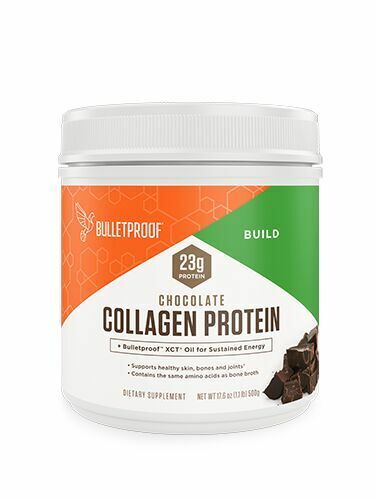 The Bulletproof Collagen Protein Powder is designed to not only pose as a meal replacement (with its 23 grams of protein), but thanks to the inclusion of collagen, it helps to improve your complexion and recover your aching joints (whether that be from working out or other activities, I don’t judge). Despite the fact that it contains less than one gram of sugar, both the vanilla and chocolate flavor protein powders are rich and sweet. Giving you something to look forward to consuming after that grueling hour-long cycling class. You may be familiar with the Tone It Up brand, founded by the two OG fitness influencers, Karena Dawn and Katrina Scott. The Tone It Up community is basically an IG fam that K & K started through their curated workouts that connects women who are on all sorts of different fitness journeys. Because don’t we all want to live our best, fit lives? The brand also started a nutrition line (in addition to their workout apparel and gear), which includes, you guessed it, protein powders. 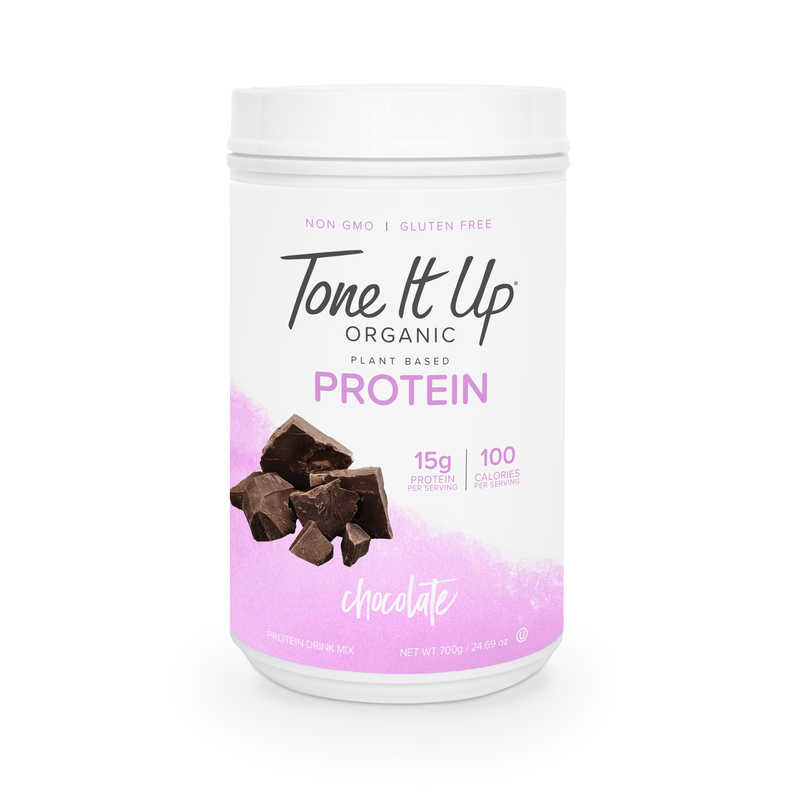 Tone It Up’s Organic Proteins are perfect for smoothies. They add 15 grams of protein per serving and zero grams of sugar. All while being all super healthy things like organic, vegan, gluten and dairy-free. The best tasting powder IMO is the chocolate (they also have coconut and vanilla flavors). It is sweet, smooth, and makes for a thick consistency to have you feeling extra-full. You’ve probably tried (or at very least seen) a Quest protein bar at your local 7-11, Target, GNC, wherever. But in my eyes, the brand’s real star is their protein powder, specifically, the cookies and cream powder. The powder has chunks of “cookies” in it, and when blended with 8 oz. of water and a few ice cubes, really will trick you into thinking you’re chugging a milkshake. One serving size is one scoop. It has 20 grams of protein and only 100 calories, so it’s good for a snack at any time of the day. If you’re also watching your sugar intake, then you’re in luck. Although it tastes like a milkshake, there are zero grams of sugar in the powder. 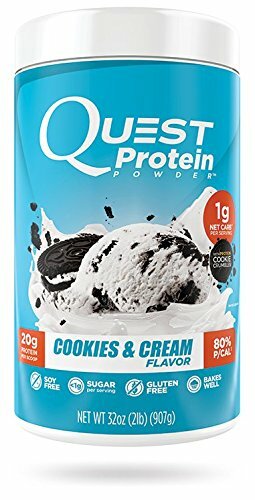 If you’re fancy (or at least way more creative/better in the kitchen than I am) then this is one of those protein powders that can be used as an ingredient to make those protein powder pancakes, cookies, or balls that you see all of those *fitness influencers* on your newsfeed constantly eating.